Biography, Paintings of Russian Expressionist Painter. One of the great expressionist painters, Chaim Soutine was born in Russia, but spent most of his adult life in France, where he was part of the Ecole de Paris. He studied art at the Vilna Academy of Fine Arts and then in Paris with a tutor of the Ecole des Beaux-Arts. His initial focus was mostly on still life painting, although he gradually moved towards portraits and landscapes. His later works are more reflective of expressionism, his main influences being his friends Paul Cezanne (1839-1906), Vincent Van Gogh (1853-1890), Marc Chagall (1887-1985) and Amedeo Modigliani (1884-1920). Soutine's best known works are impasto portraits of cooks, page boys, and waiters, such as: Little Pastry Cook (c.1921, Portland Art Museum) and Pastry Cook with Red Handkerchief (c.1922 Musee de l'Orangerie, Paris). His series of expressionist paintings of animal carcasses (eg. Carcass of Beef, 1925, Minneapolis Institute of Arts) were influenced by similar works of Rembrandt, such as The Flayed Ox (1655, Louvre, Paris). 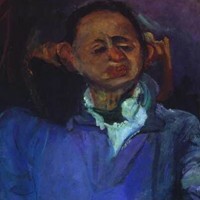 Persecuted during the war by the Gestapo for being a Jew, Soutine died in sad circumstances whilst in hiding. Now seen as one of the top expressionists in Russian art, his paintings sell for millions. see: Analysis of Modern Paintings (1800-2000). Albright-Knox Art Gallery, New York. Soutine was born in Minsk, Belarus, in 1893, which was then part of the Russian Empire. He was born into poverty, the tenth child out of a family of eleven children. At the age of 17 he moved to Vilnius and studied drawing and painting at the Vilna Academy of Fine Arts, where he befriended the artists Michel Kikoine (1892-1968) and Pinchus Kremegne (1890-1981). In 1913 he emigrated to Paris, where he lived in extreme poverty for many years. In Paris, he lived in Montparnasse the artist-quarter where he became friends with Amedeo Modigliani, who painted Soutine's portrait many times - see for example, Portrait of Chaim Soutine (1917, National Gallery of Art, Washington DC). Soutine also became friendly with other Russian artists like the Jewish painter Marc Chagall, who worked in virtually every artistic medium, including paintings, stained glass, stage sets, book illustrations, ceramics, tapestries and fine art prints. The dream-like visions so common in Chagall's oil painting can be seen in the subtle imagery of Soutine's pictures. Soutine studied part-time under the Ecole des Beaux-Arts tutor Fernand Cormon (born Fernand-Anne Piestre) (1845-1924), one of the leading historical painters of modern France who ten years earlier had taught Matisse, Van Gogh and Toulouse-Lautrec. He also met and was supported by the Parisian art dealer/collector Paul Guillaume (1891-1934). Soutine's early paintings are mostly dark, sombre still-lifes: see for example, Still Life with Soup Tureen (1916, private collection) and Still Life with Lamp (c.1916, Yoshii Gallery, Tokyo). In time, he moved on to portrait art - his sitters were painted with sickly yellow skin, and slightly abstract expressions, reminiscent of Modigliani. Examples include Self Portrait (1918, The Art Museum, Princeton University), and Little Girl with Doll (1919, Alex Hillman Family Foundation, New York). During the 1920's Soutine's portraits become distorted - his figures seem to be melting into the canvas: see his Little Pastry Cook (1922, Portland Art Museum, Oregon) and Woman in Pink (1921, private collection). One of Soutine's greatest portrait paintings is that of Madeleine Castaing (1929, Metropolitan Museum of Art, New York). This is an exceptionally probing portrait of a woman who was important to Soutine during the late 1920s and early 1930s. Castaing and her husband were fervent supporters of the artistic community of Montparnasse and became intimate friends of avant-garde artists and writers such as Pablo Picasso, Andre Derain, Fernand Leger, Blaise Cendrars and particularly Soutine. The Castaings met Soutine at an exhibition in 1927, and between 1931 and 1935 he spent summers working from their mansion near Chartres. They offered him support and protection after the death of his dealer in 1932 and bought many of his works. This particular portrait of Madeleine is regal, and perfectly captures the sitter's presence. It also conveys a nervousness and impatience of expression. The lady looks chic and cosmopolitan, yet vulnerable - an aspect which the artist captures with expressionistic brushstrokes, heightened colour schemes and unusual vantage points. Although living in Paris, surrounded by a large group of Jewish immigrants including, Modigliani, Chagall and Jacques Lipchitz, Soutine struggled constantly with both poverty and ill-health. Sometimes he resorted to standing at the counter in cafes, in the hope that someone would take pity and buy him a meal. Unfortunately, he was not prone to helping himself, the artist was notoriously private about viewings of his work, insisting sometimes that would-be patrons buy before viewing. His fortunes changed in 1923 when he met the American collector Dr Albert C Barnes. Barnes visited Soutine's studio and purchased 100 of his paintings. 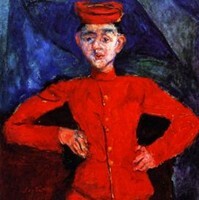 The relationship continued for the next few years, allowing Soutine some stability. Those Barnes paintings can now be seen at the Barnes Foundation, Merrion, Pennsylvania. Barnes collected some of the finest works by French Impressionist painters, also Post-Impressionist painters, and early 20th century expressionist painters. Around this time, between 1923 and 1925, Soutine spent time in Southern France, where his palette became brighter and more luminous, although he continued to suffer from ill health. An important work from this period is Portrait of Oscar Miestschaninoff (1923, Musee National d'Art Moderne, Pompidou Centre, Paris). Between 1925 and 1929 Soutine began work on his famous paintings of animal carcasses. He kept the carcasses in his studio for weeks at a time, driving neighbours crazy with the stench. He painted at least 10 in the series, and these works have been most identified with his name. Le Boeuf Ecorche (1924) sold for a record £7.8 million to a private collector in 2006 at Christie's London. Others in the series include Hanging Hare (1923, private collection) and Carcass of Beef (c.1924, Minneapolis Institute of Arts). There are similarities between Soutine's work in this subject matter and Francis Bacon who worked the same theme many years later. Another important work from this time is Pageboy at Maxim's (1927, Albright-Knox Art Gallery, Buffalo NY). Soutine was finally recognised as an artist of significance in 1937 when he exhibited at the Galerie Nationale du Jeu de Paume in Paris. Tragically, soon after this, the Germans invaded France, and as a Jew, Soutine was singled out for persecution. He spent the next few years hiding from the Gestapo, sleeping rough and in forests. Suffering from a stomach ulcer, he left his hiding place to undergo surgery, which failed to save his life. He died in 1943 and is buried at the Montparnasse cemetery in Paris. Paintings by Chaim Soutine can be seen in many of the best art museums throughout the world.  For more biographies of Russian artists, see: Famous Painters.  For details of the Ecole de Paris, see: History of Art.  For more information about modern painting in France, see: Homepage.